This plugin will break many APIs and other plugins when there is a job in the queue. 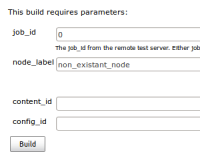 The queue parameter is missing the 'value' entry that is sent from Jenkins through JSON. See output after build.actions below. Create a job that uses the NodeLabelPlugin. Build with Parameters, and fill in some some parameters (see screenshot). Take a look at the queue (see screenshot).